Treat a post in the middle of the floor just like the walls when installing laminate, or for that matter any flooring matterial that is prone to expansion. Every installation instruction manual that I have read states that you must ensure a minimum of a 1/4 inch gap on all walls when installing flooring. 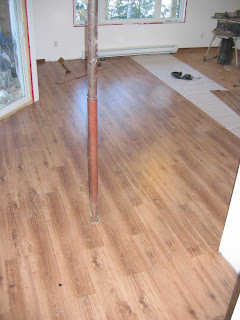 The same goes for ANY obstacle that the flooring will encounter -- like the post in the picture. This way any expansion will be easily accommodated.